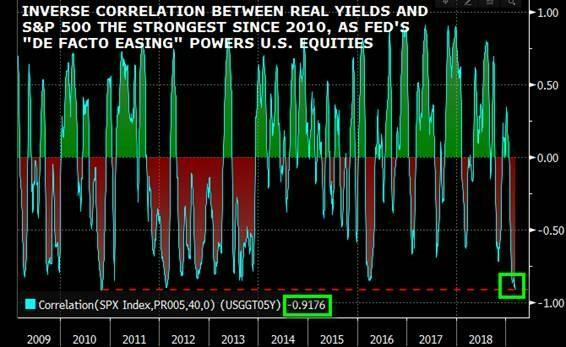 Furthermore, as the chart below shows, the inverse correlation between real yields and the S&P is now a "stunning" -92%, levels last seen during QE1. Yet it's not all smooth sailing for a market where as McElligott writes today, equities are now a pure "flow show", with the derivative strategist warning that following last week's euphoric burst higher, the coming 2-4 week "window" set a stage for a potential supply/demand pivot, as a result of the following six factors. 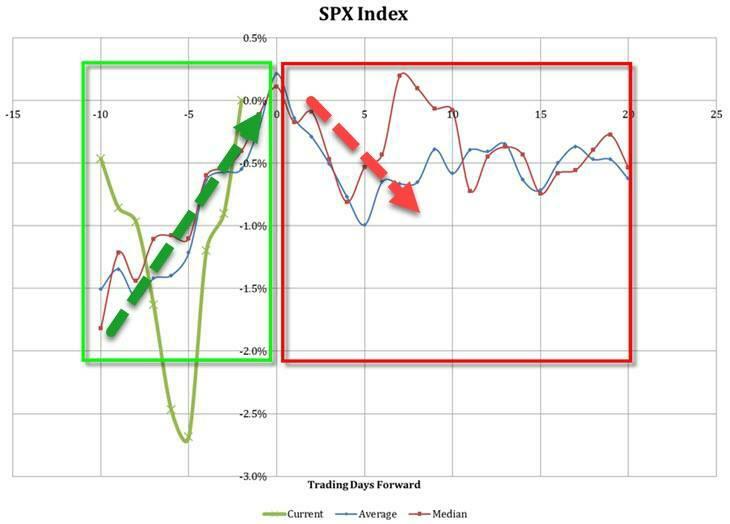 The first one is that last week's capitulation equity inflow is actually an adverse signal for markets. 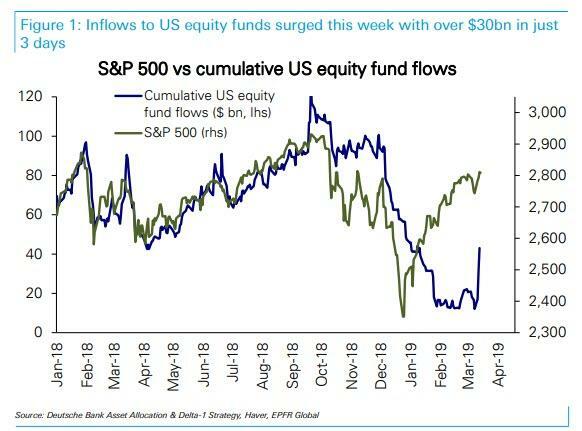 As we discussed earlier, last week "sidelined" bears finally threw in the towel, as following large outflows of over $100bn since October, US equity funds this week saw inflows surge with over $31bn in the first 3 days, helping drive the S&P 500 back to the top of its recent range. 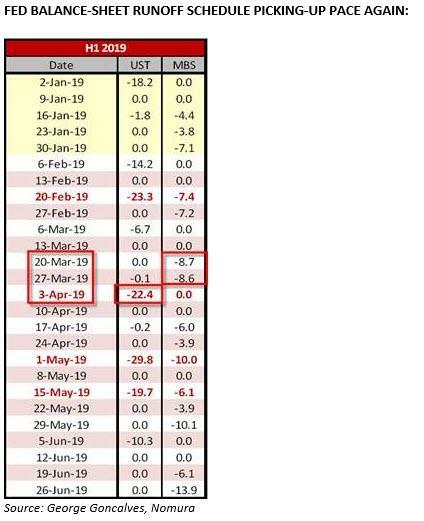 Nomura subsequently defined this massive inflow into stocks as a "QE-type fund flows capitulation" from investors (largest 1w inflow for USEQ Passive-, Institutional -and Overall- of the past 12m), and noted that last week's inflow represented a "100th percentile" US Equities inflow in the history of EPFR fund flow at $25.5B—the 4th largest weekly US Equities inflow in history (data back to 2002). 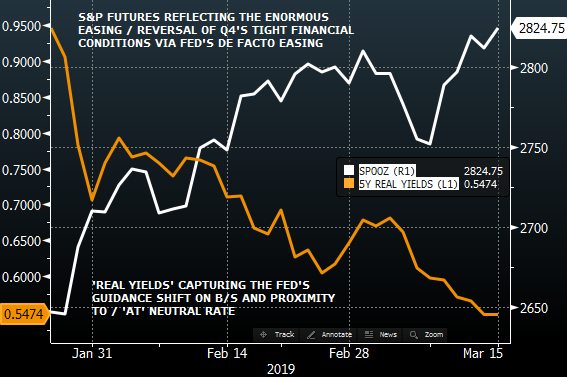 This type of capitulation, however, is concerning because as Deustche Bank noted over the weekend, in a majority of episodes surging inflows were a contrarian indicator. 6 out of the 9 episodes saw the S&P 500 fall an average of -5.9% over the course of the following one month, accompanied by outflows. Nomura adds to this observation, and writes that most prior “Equities Inflow Outliers” (the Japanese bank ran a test for "months since 2006 where flows were +$19.9B or more for the month = 95th %ile”) shows strongly negative equities returns over the next 3m, with 2w returns particularly negative (happened 8x’s since 2006), or specifically, the 2 week S&P return is -3.8% with 25% hit rate; 1 month us -3.8% with a 50% hit rate; and the 3 month -2.4% with a 50% hit rate. 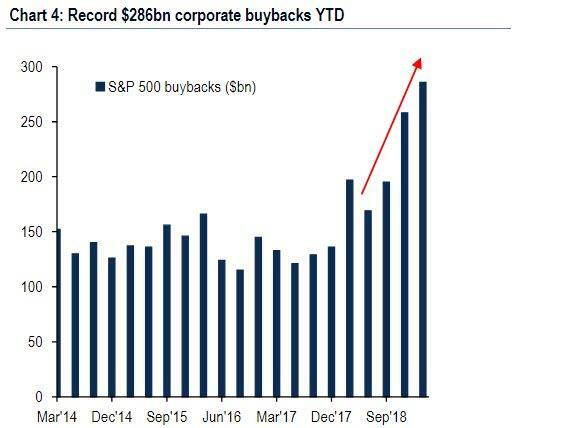 Unlike the end of 2018 which saw a monster buy-order from Pensions helping to lift stocks in the last days of the year, quarter- and month-end pension rebalancing flows should be particularly significant as SPX has outperform Bonds by over 12% QTD — a 91st %ile move since 1973, according to Nomura, which notes that this "sell equities, buy USTs" flow begins to emerge approximately 5 to 10 days prior to Quarter-end. 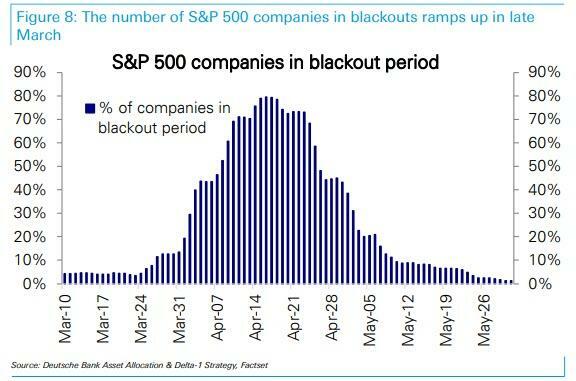 Commenting on the temporary loss of this key upside drive, McElligott calls it the "monster demand flow" of the past 10 year period for US Equities, adding that "we are seeing repurchase desks around the Street reference 1Q19 as “THE” largest notional $buyback ever, with last week particularly heavy ahead of the “blackout” commencing in-earnest this week (75% of S&P 500 in buyback blackout by 3/19/19)"
Of course, since in this market the only thing that matters is what the Fed says, all of the above may either be reversed by 180 or supercharged based simply on whether the algo reaction to Powell on Wednesday is "too dovish" or "not dovish enough."